S is for STEM and S is for Spring! Away go the skis and skates and out come bikes, bats, and balls of all sorts. It’s spring and that means endless opportunities for kids to engage in the scientific process outside! So to get you started, we’re sharing a book that offers 25 ways for you to engage your young scientists in learning about the magic of spring. What better way is there to learn about soil temperature than to stick a thermometer in the dirt? But is that all there is to it? Well, that wouldn’t be much of an experiment, would it? But if the experiment involves finding a sunny spot and a shady spot and charting changing temperatures over time, well . . . a child might learn something that way! And with simply two thermometers and some paper, there’s not much to it! But it’s a learning experience that teaches kids how soil warms in the spring and it teaches them how to conduct a simple experiment and draw conclusions. The experiments in this book also prompt kids to question and investigate even further. With the soil experiment above, for example, kids are asked questions such as, “Did the soil in one area warm up faster than the other?” As a parent or educator, you can take this to the next level and work with your student to figure out just how much faster the soil in one area warmed up as compared to the other. By tying different colored yarn and ribbon around the yard at different heights, kids can figure out whether the birds in their area prefer a certain color or material more than another, and which height the birds like best. Copyright © 2012 Nomad Press All Rights Reserved. Today’s post is contributed by Sue Heavenrich, who writes about science and books at Archimedes Notebook. I don’t need a calendar to mark the season: just the slant of the sun and the noisy birds outside my window every morning let me know that it’s spring. To celebrate the return of the robins – and red-winged blackbirds and mourning doves and …. 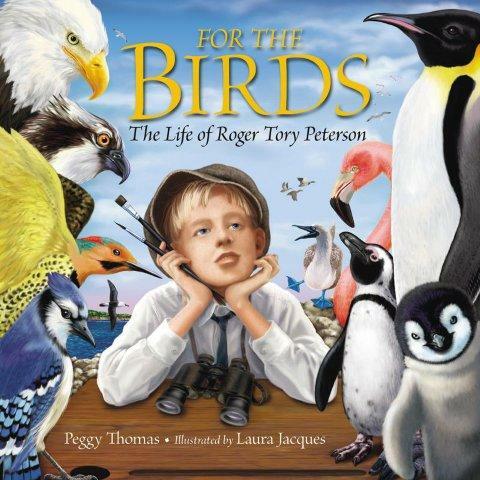 I’m sharing a book about birds. I knew I would love this book from the moment I opened the cover – immediately inside is a field description of a birder, complete with identifying markings, habitat and range notes and a clear description of its call. What a great way to introduce a biography of the guy who gave us the Peterson Guides. If you’ve ever wanted to know what a bird or flower or tree or rock is, there’s a good chance you’ve grabbed a Peterson guidebook. The idea of organizing information so anyone can access it quickly – whether by flower color or the silhouette of a bird – that’s only one of Roger Tory Peterson’s gifts to us. He also helped develop a public conservation awareness that endures. Add your link for March 16, 2012 in the comments below. Next week, STEM Friday will become a theme as well as a meme. The hosts for each week will be invited to post here at the STEM Friday blog as contributors. STEM writers and STEM book bloggers are invited to sign up as contributors (below). The names of ALL contributors will be listed in a NEW contributors sidebar, one that will link back to each contributor’s blog. We will continue our meme and invite other bloggers to add their STEM Friday blog posts links each Friday. We will also begin a new meme item — and ask for STEM links to be added to the comments as well. We are looking for news, lesson plans and other STEM resources to share. These links will be added to a NEW STEM resource page. Together we can create a webpage of STEM books and resources we can all use. Does one of these dates work for you? Add your name, blog title, and a date to the comments. is at NC Teacher Stuff.